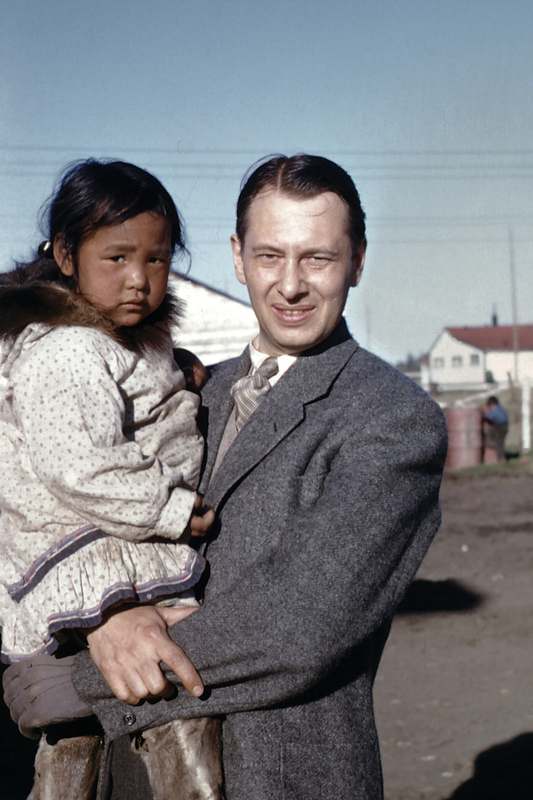 Oilman: Gordon Purdy holds an Inuit girl during a visit to Aklavik, N.W.T., for Imperial Oil. Through the worst years of the Great Depression my father slogged away, first getting a degree in chemistry, then a post-graduate degree. That led to a job in a chemistry lab, then marriage to Mom, and his first child—me. That was his situation in July 1941, a time when German bombers were dropping incendiary bombs on London and setting the city ablaze. 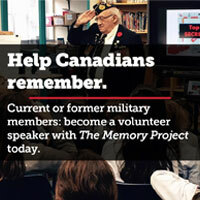 Dad was on loan to the Canadian government from Imperial Oil, and worked in the Sarnia lab. 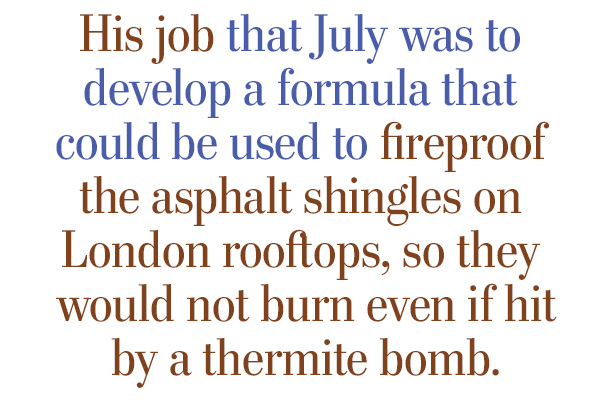 He was developing a formula to fireproof the asphalt shingles on London rooftops, so they would not burn even if hit by a thermite bomb. In order to test his compound, Dad had to manufacture the ingredients of a German thermite bomb in the lab. He was stirring the ingredients in a mortar with a pestle when the concoction exploded. The bowl directed the blast into his face. The rim of the bowl broke into high velocity fragments across his stomach, and in a line across the wall of the lab, just above another chemist across the room, who fortunately had his head down reading a report. Dad’s main injury was to his left hand, which was holding the bowl of chemicals. He was blinded for several days, but fortunately his sight returned unimpaired. Surprisingly, he was not knocked out, and remembered his travel to the hospital. He said he felt that he had a hangnail on his left hand, which bothered him in the ambulance. Once at the hospital the doctors examined him carefully, and advised Dad that his left hand was so badly damaged they would like his permission to amputate. The problem was that Dad, with his temporary blindness, couldn’t see for himself how much damage there was. Being a logical scientific type, he debated with the doctors about how much amputation was needed. He asked if they could retain his thumb, but they said no. Reluctantly Dad gave his consent, and his hand was amputated just above the wrist. That is not the end of the story though. Because Dad couldn’t see at the time, he asked Mom to take the amputated hand home and photograph it so that he could see it later. It couldn’t happen today, but this was wartime, and that is exactly what Mom did. She took Dad’s amputated hand home, put it in the fridge overnight, and the next morning put it on a kitchen chair in the back yard, and photographed it with the family Brownie camera. She then wrapped up the hand and returned it to the hospital. Do they still make Moms who can do that sort of thing? I have that picture in an old album to this day. There is no question the doctors were right. I was only two years old at the time. I have a snapshot memory of standing beside Dad in the hospital bed but that is all. As far as I was concerned as I grew up, Dad always had one hand. 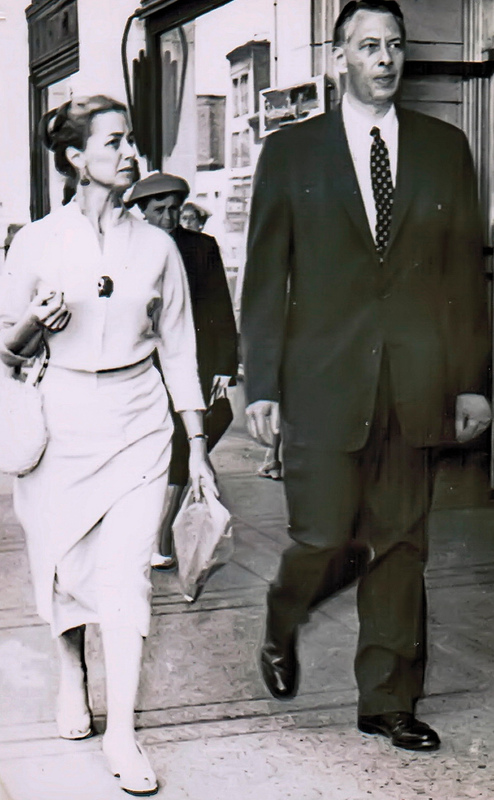 Discreet: Gordon Purdy with his wife Dorothy, during a trip to Vancouver, wears a glove on his left hand. In fact, he had several hands. They plugged into a socket at the end of the prosthesis he wore buckled to his left arm. He had a hook, just like a pirate. He also had a natural-looking hand he wore with a grey kid glove most of the time, and a special yoke he used to hold his shotgun. He was an accomplished amateur artist, and the loss of his left hand did not affect his considerable painting skill. He was also an accomplished woodworker. He was more than a carpenter, and could make furniture. Although he sometimes got frustrated, there were also advantages to his one hand. He could run a board through a table saw in his home workshop, holding it down with his hook without worrying that it might slip into the whirling blade. If he was wearing his hook, stirring a fire in the fireplace or in the woods was always a startling sight for the uninitiated. He would just reach into the fire and move the burning logs around without bothering with a poker. There were moments of artificial hand humour too. Most people didn’t notice that Dad’s left hand wore a grey glove while his right hand didn’t. I was with him once when we got off a crowded bus in Toronto. As Dad stepped down onto the street his hand fell off and rolled a few feet into the busy sidewalk, to the horror of all who witnessed it. Dad just picked up his hand and plugged it back into his arm. We both thought it was pretty funny. It was much later that I started to realize that Dad was as much a war vet as all the men who wore uniforms. He never wore a uniform or got a medal, but he was an agent of the government who was grievously wounded while combating the enemy in time of war. As far as I’m concerned, when I’m honouring our veterans on November 11, I will be honouring Dad and all those other civilian fighters too.